Do you make the best chili in the neighborhood? All of Weaverville? Well here’s your chance to prove it! 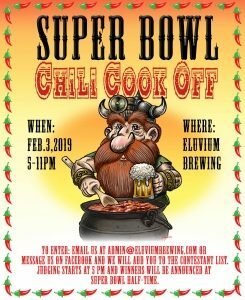 Join us as we host the First Annual Super Bowl Chili Cook Off @ Eluvium Brewing Company. Bring your chili and let the people decide whose is best! Winner and Runner-up will receive prizes from the brewery. Entry will be limited to the first 15 participants. If you want to enter, email us at admin@eluviumbrewing.com or message us on Facebook. And we will add you to the contestant list here. On Superbowl Sunday we’ll provide tables and power supplies for everyone to set up there crock pots or cookers. Folks will sample each chili and everyone who buys a beer that day will get a ticket which they will use to vote for their favorite chili. Whoever gets the most votes wins. Judging starts at 5 pm and winners will be announced at Super Bowl half-time.